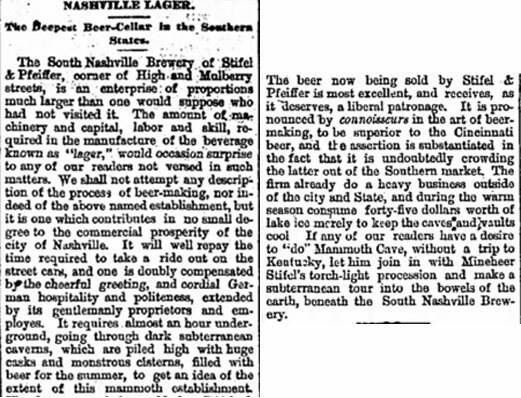 Just prior to the Civil War in 1859 Jacob Stiefel (aka “Stifel”) built a small brewery just south of downtown Nashville. This endeavor was due to Nashvillians’ request for fresh local beer, which was virtually nonexistent in the South, as most beer was transported via riverboat from the Midwest. 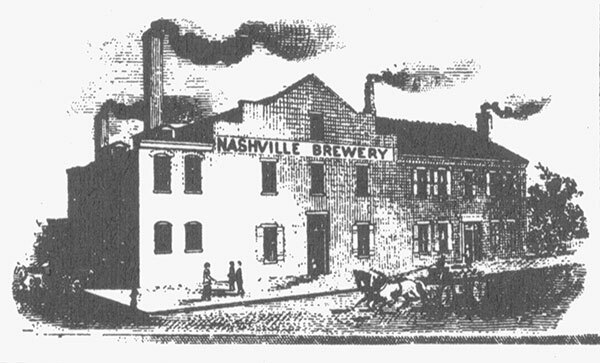 Located on South High Street (now 6th Ave S.), the Nashville Brewery opened its doors to satisfy the thirst of the city’s hard-working citizens. Though operations halted briefly during the Civil War, the brewery overcame the disruptions and re-opened in 1864. With a focus on German style lagers, Stiefel and his business partner Louis Pfeiffer, continued brewing quality beer for the next 12 years under the name South Nashville Brewery. 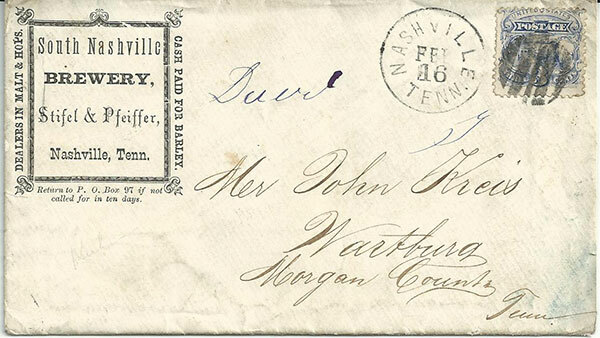 An envelope from the South Nashville Brewery (from the collection of Scott Mertie). Letterhead from the South Nashville Brewery (from the collection of Scott Mertie). 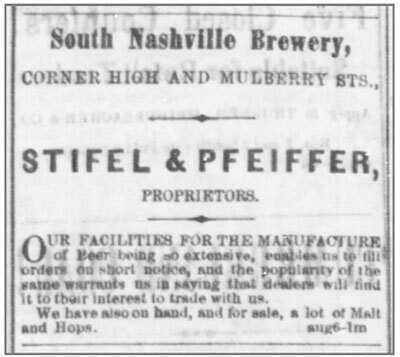 Due to the sudden death of Pfeiffer in April 1876 the, Nashville Brewery was operated briefly by J.B. Kuhn. Over the course of the next decade, there would be various owners of the Nashville Brewing Company. The Maus Brothers took over in 1877 and three years later John Burkhardt in 1880. In 1883, Burkhardt partnered with William and Archibald Walker of Cincinnati (via Scotland). 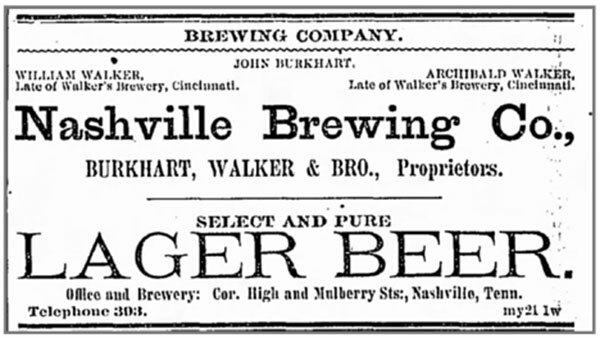 Two years later, the Walker brothers bought out Burkhardt and operated the brewery through the end of the 1880s. 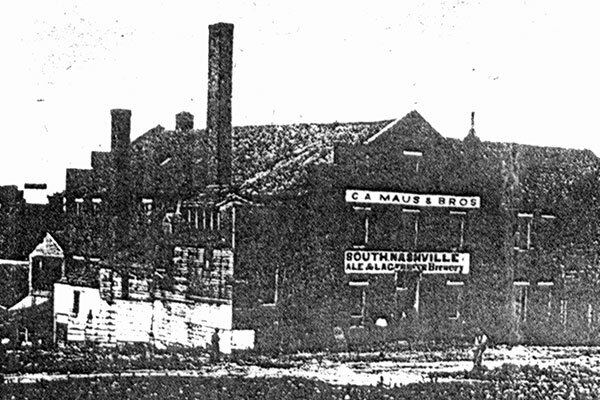 An 1878 picture of the South Nashville Ale and Lager Brewery (aka Nashville Brewery) when it was owned by C.A. Maus & Brothers. 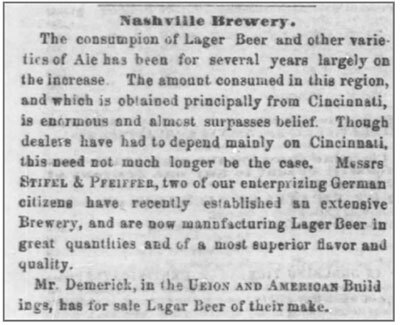 In the summer of 1889, Archibald died suddenly, which prompted the sale of the Nashville Brewing Company to two German brewers from Cincinnati. In January 1890, the prominent Cincinnati brewer, Christian Moerlein acquired the Nashville Brewing Company, with his apprentice, William Gerst. As a result of Moerlein’s successful Cincinnati endeavors, he practically had unlimited resources to invest into the Nashville brewery. He had plans to rebuild the brewery into one of the largest operations in the South. Gerst relocated to Nashville to oversee operations of the newly named Moerlein-Gerst Brewing Company. By the end of 1890, the original Nashville Brewery was rebuilt into a massive complex, with the capacity of brewing 50,000 barrels annually. Gerst later bought Moerlein’s shares of the brewery in 1893 and operated as the famous William Gerst Brewing Company until 1954 when it closed due to national competition. 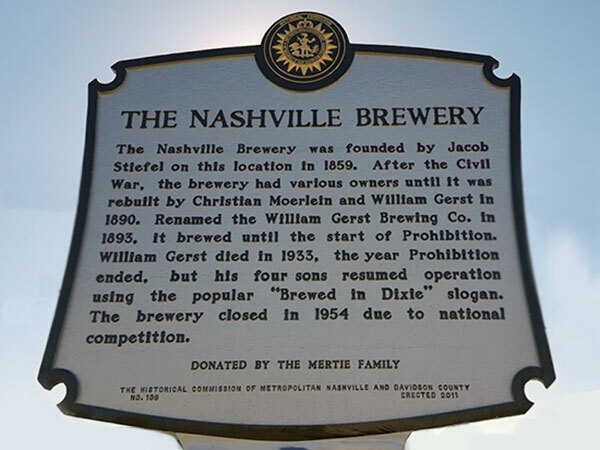 Historical marker for the Nashville Brewery donated by the Mertie family. 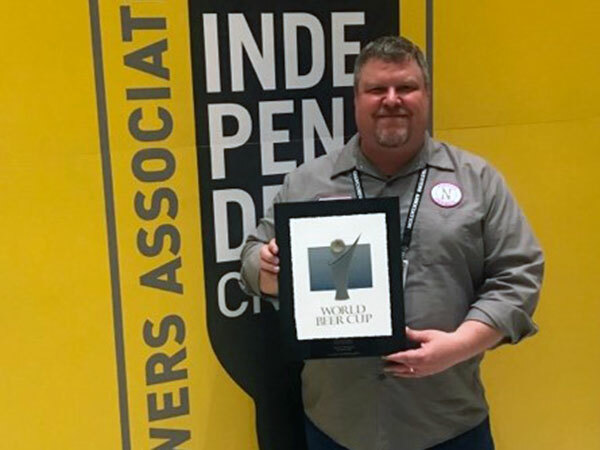 When Scott Mertie moved to Nashville in 1992, he began collecting breweriana from the Gerst Brewing Co. Over the next decade, he started obtaining more information about Nashville’s brewing past. In 2006 Mertie wrote Nashville Brewing (Acadia Publishing 2006). 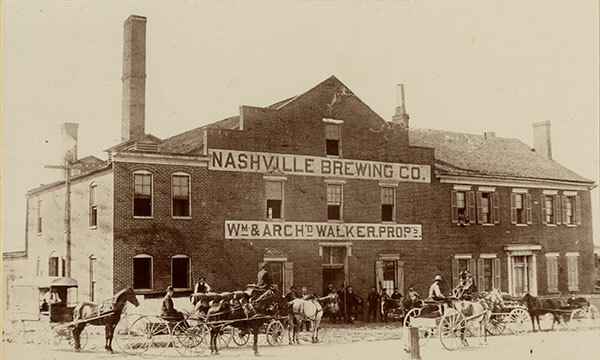 In 2011, Scott and his wife spearheaded the Nashville Historical Commission to erect a marker where this historic brewing location existed for nearly 100 years. See more on Scott's background. Scott Mertie admiring the first batch of beer by the Nashville Brewing Company (2016). 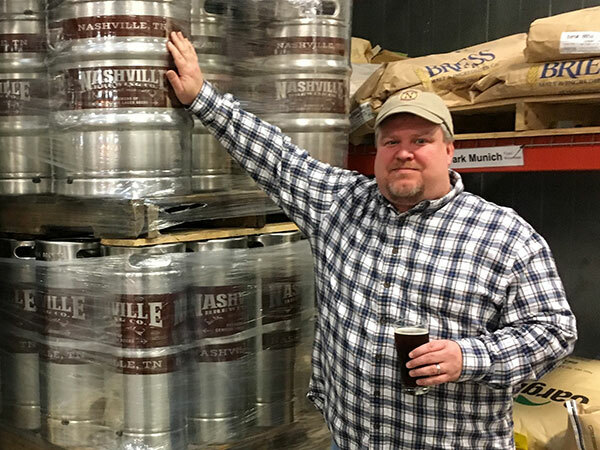 Mertie’s dream of reviving the Nashville Brewing Company became a reality when Nashville Lager, hit the market in December 2016. Mertie partnered with long-time friend Kent Taylor, co-founder of Blackstone Brewing Co., to contract brew the brand. It is appropriate that Blackstone is Nashville’s oldest operating craft-brewery, dating back to 1994. 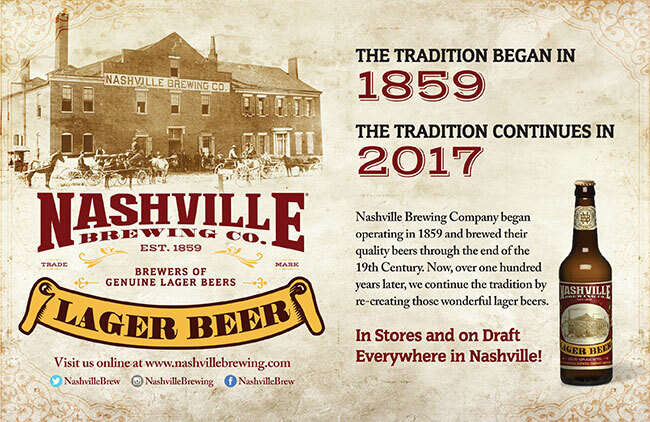 Over 165 years since the Nashville Brewery opened, the brand is now available again for thirsty Nashvillians to enjoy again. In stores and on draft everywhere in Nashville.